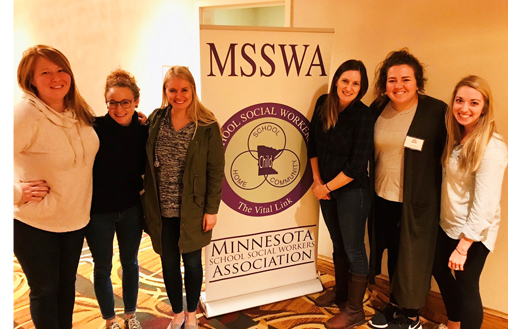 Fridley Public Schools social workers attended the Minnesota School Social Workers Association (MSSWA) Conference in Minnetonka on October 28-30, 2018 - where they participated in a variety of workshops including suicide prevention, trauma-informed schools, adverse childhood experiences, ethics and more. Fridley Area Moore Lake Social Worker MacKenzie Laurion said she valued the trauma-informed schools training at the conference. “We discussed how we interact with students in our buildings, how external challenges can impact students in the classroom, and how prevalent ACEs (adverse childhood experiences) are for the children and youth that we work with,” Laurion said. Fridley Public Schools was one of a few districts to receive funding from a Minnesota Department of Education grant in 2016. This funding enabled the district to hire a social worker for each of its schools, ensuring that our students and families receive comprehensive support from preschool to 12th grade. The social workers are each members of their schools student support services team. New for the 2018-19 school year, Fridley Community Education was able to add a new social worker position. The new position, filled by Bethany Grove, works full-time at the Fridley Community Center and serves as a resource to seniors, community members and Fridley Preschool families.